The CG85-95S Dryer delivers unrivaled performance, programmability and smooth advanced drying technology to a new, industry unique capacity of 85-95 pound load weight. Smart construction keeps heat inside the dryer, removing load moisture while ensuring a cool and whisper quiet work environment, shorter dry times, lower energy bills and maximum throughput in a compact footprint. Available in in natural gas (LP), electric and steam heated models. Oversized and reversing loading door with industry unique 23.3 cubic foot cylindar constructed of annealed stainless steel. TransFlow™ pushes heated air through drum perforations from the back and top using a patented combination of axial and radial airflow technology. Heated air then recirculates for the ultimate in fast, efficient load drying performance. A towel load from an EH080I washer dries in less than 25 minutes. Heat Capture Technology gets the dryer up to set temperatures quickly and keeps that heat energy inside where it belongs. 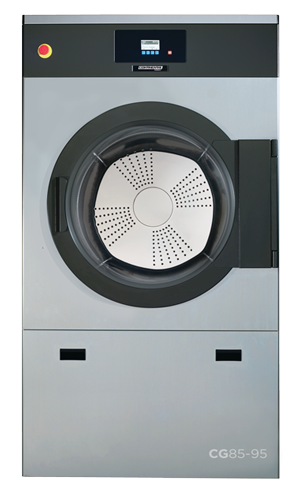 Heat is kept inside the dryer through insulated pannels and double-glazed dual-pane door system. Tight design ensure no leakage of heated air to ensure a more pleasant work environment, along with quick drying cycles, lower utility costs and labor production. Operators can manually change rotation speed, temperature, time and moisture settings on the fly, in mid-cycle. Controls rotation speed of the drum – In automatic mode, drum rotation speed can be adjusted to suit the residual moisture content of goods. In manual mode, drum rotation speed can be varied with the cycle activated. Sensors automatically stop the drying process once the load reaches a pre-set moisture level. Eliminates operator error, improves productivity and prevents fabric damage and shrinkage. Continuously monitors load temperatures and allows total control over cooling speed. SmoothTouch Drum perforations for unrivaled smoothness and load care. Drum is constructed of durable AISI 430 annealed stainless steel. Industrial trunniun, shaft and bearings are driven by a durable belt drive eliminating cylinder rollers. Large, 28-inch door opeing for ergonomic loading and unloading. Large-capacity lint filter and easily accessed drive belt make for simplified maintenance. Backed by a Limited 3-Year All Parts and 5-Year Bearing Warranty.